(Phys.org) —A pair of researchers, one with the Institute of Earth Sciences at the University of Iceland, the other with University College in London, has found that mixing carbon dioxide with water and pumping it into underground basalt formations in Iceland has resulted in 80 percent of the carbon being sequestered into carbonate materials within one year's time. 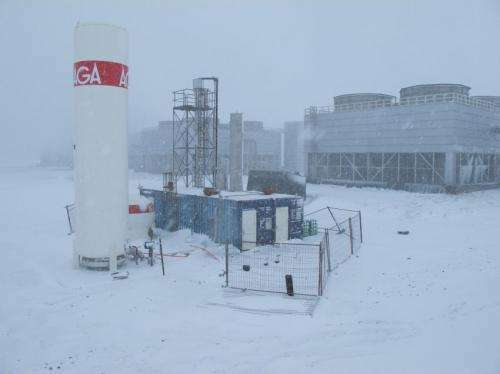 In their paper published in the journal Science, Sigurdur Gislason and Eric Oelkers suggest their method of carbon sequestering may prove a feasible approach to carbon capture and storage (CCS). As the planet continues to warm due to greenhouse gases (mainly CO2) captured in the atmosphere, scientists focus on two main approaches to solving the problem: stopping (or at least slowing) the addition of new gasses into the atmosphere, or devising techniques to remove the gasses already there. In this new effort, the researchers are focused on the latter approach. Most of the press dedicated to global warming to date has been focused on ways to reduce greenhouse gas emissions. Sadly, that approach hasn't had the desired impact. Because of that governments and organizations are increasingly turning to CCS technology. Just this past week the U.N. issued a climate report which highlighted the necessity of putting more effort into removing gasses to slow the massive costs of the expected average rise in global temperatures in the near future. The problem with pulling carbon out of the air is where to put it—pushing it into the ground is both expensive and risky—geologic activity, such as earthquakes could cause fissures allowing the gas to seep back out into the atmosphere. 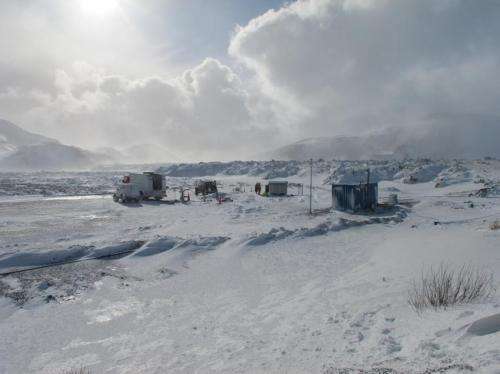 This is where the researchers in Iceland come in—they've been dissolving carbon dioxide into water (from a geothermal plant) and pumping the mixture into basalt formations (that came about due to volcanic activity) underground. Over time, the carbon reacts with calcium, magnesium and iron in the basalt and forms carbonate minerals such as limestone. Scientists have known about this process for some time, but until now, didn't realize it could happen so quickly. The researchers report that approximately 80 percent of the carbon became embedded in the minerals over the span of just one year. The down side is that it takes a lot of water—up to twenty times as much as the carbon dioxide. Another problem could be pulling the carbon dioxide out of the air, and perhaps having to transport it to a sequestration site. There is also the difficulty of finding the right kind of basalt—it has to be porous. Regardless of the problems, it appears likely that the cost of storing carbon dioxide in such fashion (or others like it) will likely become relatively smaller as the costs of dealing with rising temperatures and sea levels increases, which hopefully, will cause more such efforts to come about. All the carbon in the atmosphere, living creatures, and dissolved in the oceans is derived from rocks and will eventually end up in rocks, the largest carbon reservoir on Earth. The carbon moves from one reservoir to another in what is called the carbon cycle. Humans have accelerated this cycle by mining and burning fossil fuel since the beginning of the industrial revolution, causing rising atmospheric carbon dioxide (CO2) concentrations that are the main cause of global warming. One option for mitigating high levels of global warming is to capture CO2 and safely store it for thousands of years or longer in subsurface rocks. By accelerating carbonate mineral formation in these rocks, it is possible to rebalance the global carbon cycle, providing a long-term carbon storage solution. However, this approach is both technically challenging and economically expensive. Amazing how the loss of atmospheric stock oxygen, is simply ignored. b) Have even MORE renewable energy production capacity than in a) to pump into CO2 sequestration (because you need to compensate losses of the procedure) in order to offset fossil fuel use. Any way you slice it a) is cheaper. While this might work in places where renewables are abundant (Iceland) it's a stopgap measure. Eventually we'll be back to square one as the store gets saturated. It hides the problem but doesn't make it go away. CO2 is 400ppm. O2 is 21 percent. And the O2 you're binding was already bound in the CO2 - no biggie.